The area of excess Antarctic sea ice is almost large enough to cover the entire state of Alaska. Exactly! I think mid-winter is around the 20th June. Please, what does “anomaly” mean in this context? My online dictionary is not much help. I infer it means a change from something — but what? Anomaly means the difference from the average value for that particular date (month/day), so you can compare ice levels across the calendar year adjusting for the annual melting and freezing cycles. 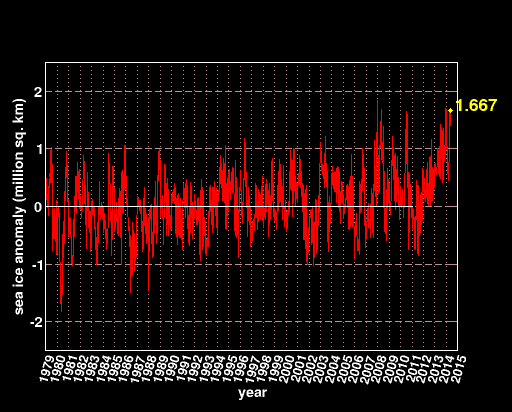 So right now Antarctic sea ice is 1.6+ million square kilometers above the average value for early May, even though the absolute number is several million square kilometers smaller than it will be in a few months. Paging Al Gore… maybe the Messiah in the White House would care to comment? Hillary probably thinks it is in response to a YouTube video. Thin ice due to more rainfall due to higher temps. If you look at thickness, it isn’t there. If you look at thickness, it isn’t being physically measured. When it’s -40 C over the Southern Ocean, and Fred Fox looks for rainfall, higher temps, and a brain, it isn’t there. zomg weather changes? Quick everyone panic and fund my study so i can live like a king by keeping you in fear!!!!!!!!!! “Global Warming” was clearly a fraud causing our geniuses at the National Academy of Sciences to bless and implement the insane spraying of 20 million tons/year of aluminum fibers since about 1995. This spraying has had the desired effect of reflecting sufficient sunlight to plunge us into the coming Global Cooling with a vengeance. Before this generation is over there will be world prayers for Global Warming. COLD is and always has been the implacable enemy, especially when coupled with our engineered food shortages. Well done cretins you will get your mass die off. Then what? I’m not really sure aluminum comes in fibers. I thought it was a metal. I’m also not really sure how aluminum would stay up in the sky. I’m not even sure how you can operate a computer with a ganglion for a brain. Sir aluminum comes in hundreds of engineered forms. A form often sprayed in our sky is married to poly fibers and designed to float slowly to earth and reflect sunlight on the way down. Please use your brain and EYES to understand what is being done to you and your progeny. We do not have too much time to react. Funny; I never see aluminum tank trucks pulled up along the Jet-A fuel tank truck at the aerodrome … nor any aluminum ‘tank farms’ at the larger airports ready to ‘fuel’ up aircraft for another ‘run’ across the country. I guess you think fire can melt steel. Just out of curiosity, #1 what kind of ‘fire’ are we talking about? Something fueled by office papers, furnishings, carpeting etc. or electric arc? #2 Are you a metallurgist by any chance? Not to worry, if you stand outside on a sunny day, the fibres will come and land on your head. Soon they will form a covering, a cap or hat, and then you could join those people protected from electro-magnetic radiation (such as sunlight) with your little shiny tin (or in this case aluminium) hat. Please note there are persons employed by our own federal government to participate in social media to monitor, and in some cases to participate in making outlandish positions and change the discussion. I note at least two here on this thread.